Green beans are a classic garden vegetable for very good reason—homegrown fresh green beans taste amazing. This is one vegetable where I realize notice the difference between store-purchased and homegrown in flavor. And with the time to harvest only a few weeks, growing them organically is easy. 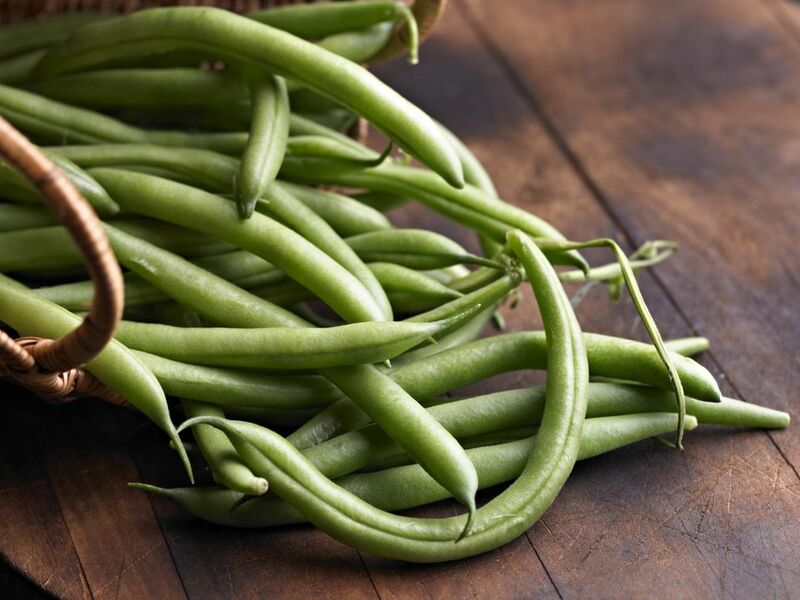 Plant green beans in the garden soil once soil can be worked after your last frost date and put the seeds about 1/2-1 inch deep depending on the variety (check the label on your seed packet for directions). Bush beans will grow on shorter stems and do not need support while pole beans, often available in the same varieties, will grow twining vines that need trellis support. Harvest the bean pods before they are fully mature so the plant will continue to produce more fruit. Once bean pods begin to mature you can leave them to dry and collect the bean seeds from heirloom varieties. Beets are grown primarily for their delicious and sweet roots, however, the crisp leaves are also edible when harvested young. Sow seeds outdoors or start them indoors if you have a shorter growing season or unforgiving clay soil. Seeds will germinate better if you soak them in water overnight first. Thin beets to 4 inches and use the thinnings in salads if you want. When beets reach 1 to 2 inches you can harvest them by simply digging them up. Use caution when harvesting them because if you are too rough the beets color will bleed and the roots will be bruised. Fresh beets can be used in a wide variety of ways for delicious, organic food. Carrots grow well, even in poor soil. In fact, adding too much nitrogen to your carrots can create lush foliage, but spindly roots. This means that carrots can naturally follow heavier feeders like tomatoes or broccoli in your crop rotation. Like other roots crops like radishes or turnips, carrots don't transplant very well but seeds can be planted directly in the garden with ease. Carrots will be ready to harvest within about 9 to 18 weeks depending on the variety. Heirloom carrots are available in a wide variety of lengths and colors so be sure to try a few different carrots to see which you like best! Kohlrabi is a delicious but very unusual looking vegetable. It's related to the cabbage but is more heat-tolerant in my experience. Kohlrabi is neither a foliage plant or a root vegetable, but rather the part of kohlrabi that you harvest is a swollen stem. Lettuce is not typical quite as fast growing as some of our super-fast vegetables, but they are still ready within 12 weeks or less. You can begin harvesting lettuce sooner if you are harvesting individual leaves, or wait a little longer to cut the whole plant. One of the best things about growing your own lettuce is the huge variety available to you. Plant lettuce seeds as soon as the soil can be worked in the spring. Heat will cause the lettuce to bolt, so these fast-growing veggies are best in an early spring or fall garden. There are four main types of lettuce, but hundreds of varieties to try, so enjoy! Peas grow best in cool weather because once things heat up the flowers cease. Enjoy peas in early spring in zones with a longer spring, or in fall gardens in garden zones where summer heat comes on too quickly. These beautiful vining plants produce bushels of delicious fruit though and can be easily preserved for eating later. Sow seeds directly outdoors as soon as you can work the soil in the spring, or plant at the end of summer for a fall harvest. You'll want to pick the pea pods when the peas begin to swell, but before they fully fill in the pod. The bigger they get the more starchy (less sweet) they become and the more the plant will shut down fruit production. Most people think you need a lot of room to grow potatoes, but not only can they be grown in larger containers or potato towers, but they also grow quickly. In our Zone 7 garden we have time to grow some bok choy, then grow potatoes, and then plant fall kale or other greens in the same spot. Potatoes are a root crop so you actually plant potatoes or chunks of potato with three or more eyes on them about 2 inches into the ground. The vines will sprout above ground and form beautiful, and attractive flowering plants. The trick for a bountiful potato crop is to continue pulling the dirt up onto the vines as the plants grow taller, leaving 6-9 inches of leaves exposed. Once the vines begin to turn brown you know it's time to harvest the potatoes - we typically dig the entire plant up, turning over the dirt and sifting through it for all the potatoes. However, if you are impatient you can begin to harvest potatoes by digging for them as soon as the plant is producing flowers. Scallions are a favorite plant in the home garden because they grow so quickly. Even sown from seed, they can begin to be pulled up within 10-12 weeks for "green onions". Scallions are usually a variety of bunching onions which will have a milder, less pungent flavor, perfect for salads and eating fresh. Sow one or two rows every two weeks through the entire summer. Scallions will grow easily through the hot summer months, unlike some of the other fastest-growing vegetables, which tend to be cool-season vegetables. Because they are shallow-rooted, these will do well in containers also, with only a little extra water. Most scallions are ready to harvest when the stems are just thicker than a pencil. Homegrown spinach has a rich and delicious fresh taste that is night and day better than grocery-purchased spinach. I love adding spinach to my garden because it tends to tolerate the heat a better than most lettuce varieties when summer comes overnight to our area. It can be easily sown directly in the garden soil most months of the year and successive planting every two weeks will provide a bountiful harvest. We typically cut the outer leaves from the spinach plants whenever we want some fresh spinach and leave the inner plants to continue producing. This method of harvesting will work for several weeks in the fall when the plant isn't going to bolt to seed, however, in the spring you'll want to be prepared to harvest the full plant much sooner. There are several named varieties depending on whether you want darker or lighter green leaves and curled or smooth leaves. Swiss Chard is an unusual plant that is an absolute favorite. Not only does it tolerate the heat of our summers incredibly well, but it is both beautiful and tasty. The leaves are spinach like, but larger, while the thick stems are celery-like in texture and asparagus-like in taste. We cook our stems apart from the leaves and so Swiss Chard is a two-for-one vegetable! Harvesting can begin within a few weeks, up to 12 weeks if you plan to harvest the entire plant at once. Sow the seeds in moist soil spring-end of summer and don't be surprised if the seeds look unusual - they are very similar to beet seed clusters. Thin the seedlings 6 to 9 inches apart and provide a good amount of nitrogen for best growth. Harvest the leaves as soon as they are large enough, using a sharp knife so you don't disturb the root system. There are many ways to cook with Swiss chard in addition to fresh leafy additions to a salad.